Noel Curran, who left RTÉ in May to work privately, will succeed Cathal Goan as the head of the national broadcaster. 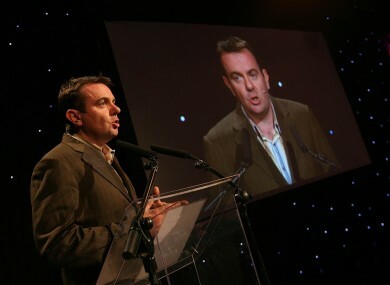 Noel Curran, seen here launching RTÉ's autumn schedule in 2006, will succeed Cathal Goan as the broadcaster's overall head in February. RAIDIÓ TEILIFÍS ÉIREANN has announced that it is to appoint Noel Curran as its new director-general, succeeding Cathal Goan next February. Curran, who was the station’s managing director of television until he quit the broadcaster in May to work in the private sector, will take the reins when Goan’s seven-year tenure ends in Spring. The Irish Times reports that Curran, a former executive producer of the Late Late Show, had also served as a current affairs editor with the broadcaster – notably founding the Prime Time series – and had worked in the private sector before being given the television job. The Monaghan native had first began working in RTÉ as a news journalist, having began his media career as a reporter with Business & Finance magazine. Tom Savage, chair of the RTE board, said Curran had been appointed following an “exceptionally intensive and exhaustive” appointments procedure that had included candidates from around the world, but that Curran had the “editorial acumen… and the business flair” to lead the broadcaster. Email “RTÉ names former TV boss as new director-general”. Feedback on “RTÉ names former TV boss as new director-general”.